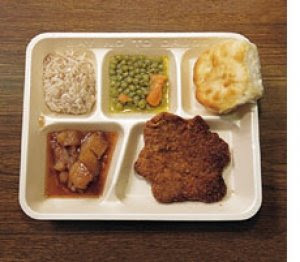 Contents: Chicken fried steak (without the gravy), apple dessert, peas, a biscuit, and rice. Leave it to the USA to serve lunch in a Styrofoam throw away try. All of the other countries appear to be using reusable dishes to serve their school lunches.